The first Indian sound film was Ardesir Irani’s Alam Ara. Master Vithal was an actor who happened to be on the path of the juggernaut of Hindi cinema history. As the hero of the first Indian talkie, Alam Ara, Vithal witnessed the same force that elevated him to a permanent place in film annals, also becoming the cause for the annihilation of his career. Before the advent of the talkie, this Maharashtrian hero was labelled the Douglas Fairbanks of India and enjoyed immense popularity as the swashbuckling star of early silent stunt films. Master Vithal was discovered by Bombay’s Sharda Film Company, where he helped shape the fledgling action genre in silent films with names like Masked Cavalier and Warrior. People interpreted the success of his rebel heroes as an indication of India’s innate desire to throw off the yoke of the British. In the late 20s, Vithal made a very popular pair with the notorious spitfire, Zebunissa and when he shifted loyalties from Sharda to the bigger Sagar Studios, in 1930, he became famous as the highest paid male star of the time. In fact, so popular was he that when Ardeshir Irani of Imperial Film Company was planning India’s first talkie, Alam Ara (’31), it was decided that it was imperative to have Vithal as the hero of this Muslim tale of yore. So, though he was not on the Imperial payroll, Master Vithal was signed on for Alam Ara. When his parent studio sued him, it was Mohammed Ali Jinnah (the architect of Pakistan and later its first head of government), who defended Vithal in court. Tragically, however, it was discovered during the course of the shooting that Vithal just could not speak Hindi well and was consequently shown either unconscious or in a trance for most of the film. Master Vithal’s career in the talkies could not survive this ignominy. As no talkie offers were forthcoming, Vithal went back to doing silent films in 1932. But the days of the cue cards were obviously over. With Shahu Modak as the hero, Vithal took to direction and his Awara Shehzada (’33), where he introduced the concept of a double role, was a success. Vithal continued to do the sporadic Hindi or Marathi film but that early luminescence of his career had dimmed. It remains one of the film world’s greatest ironies that just as Alam Ara entered the history books, it was synchronous with the termination of its hero’s glorious days. Best-known Marathi and Hindi film stunt star. Stage debut at the Rajapurkar Natak Mandali. Worked as editor at Maharashtra Film, a studio with a reputation for stunts in their mythologicals. Vithal started playing a dancing girl in Kalyan Khajina. Acted in Bhalji Pendharkar silents before breaking through at the Sharda Studio. He was its top star for several years, usually playing Douglas Fairbanks-type roles grafted onto indigenous Rajput and Maratha legends. Bhogilal Dave’s special effects accompanied his work, along with the rapid editing of directors like A P Kapur, Nanubhai Desai, Harshadrai Mehta , Luhar etc. The style Vithal helped shape had a tremendous impact, making the Sharda Studio synonymous with low-budget stunt films in the silent era. Wadia Movietone later tried to redefine the stunt genre with direct reference to the Niblo/Fairbanks figure of Zorro to distance the genre from Vithal. Apart from Alam Ara, Vithal also starred in Sagar and other Saraswati studio production, ending his career in the 60s, playing minor parts in Marathi films. Actress born in Surat as a Muslim princess, daughter of the Nawab of Sachin and Fatma Begum (later India’s first woman director). Started her career in silent films at Kohinoor at age 12. Early career was dominated by her beautiful sister Sultana, a better-known star in the 20s. Her second sister Shehzadi also became a teenage actress. Zubeida’s best-known silent work was for Manilal Joshi at the Kohinoor and Laxmi studios. Identified with courtesan roles in big Urdu, stage-derived costume pictures, a tradition extended by Meena Kumari. Developed the tragic dimension of her image in several of Naval Gandhi’s socials including the prestigious Tagore adaptation Balidan. Freelanced at the Ranjit and Sagar studios in her mother’s films: Bulbul-e-Paristan, Heer Ranjha, Milan Dinar. Set up Mahalakhsmi Cinetone (1934) with filmmaker Nanubhai Vaki. Retired at the height of her stardom in the late 30s, doing only a few films later on. *SULTANA:Was one of the earliest film actress from India and acted both in silent movies and later in talkie movies. She was the daughter of Fatima Begum and reigned as one of Indian cinema's earliest superstars and among the few women who entered films at a time when it was not considered an appropriate profession for women. *ZUBEIDA:Sister of Sultana,Zubeida established herself as big a star as her sister.Starting her career at the age of 12 with “Kohinoor”,she made infrequent appearances throughout the 20s with Sultana in popular films before becoming the lead actress of the landmark first Indian talkie film-Alam Ara. Revered actor born in Peshawar (now Pakistan) as Prithvinath Kapoor. Son of a police officer, he earned a major reputation on the amateur stage in Lyallpur and Peshawar. Interrupted law studies to join Imperial in 1929. Acted in several B P Mishra adventure and love stories as well as in India’s first talkie, Alam Ara. He impressed with a perfect speaking voice; later joined the Grant Anderson theatre company and performed Shakespeare in English with special acclaim for his Laertes in Hamlet. Worked in New Theatres (1933-39) playing the lead in Hindi version of hit bilinguals. Broke through with Debaki Bose’s Rajrani Meera and played Rama in Seeta opposite Durga Khote. Vidyapati was his crowning achievement in Calcutta. Chandulal Shah hired him for the Ranjit studio (1938-40) in Bombay where he acted in some remarkable melodramas with Kardar and Chaturbhuj Joshi. Best-known performance as freelance actor was in the title role of Alexander the Great in Sohrab Modi’s military epic, Sikandar. The film heightened his enduring reputation, enhanced by the role of Emperor Akbar in Mughal-e-Azam, as the embodiment of Mughal royalty in Hindi-Urdu cinema. Invested his earnings in Hindi theatre, setting up the Prithvi Theatres in 1944 where he produced plays while shooting films at night. Mounted a major play against partition, Inder Raj Anand’s Deewar (1945) which earned him death threats from fundamentalists. He persisted with technically and artistically masterful plays Gaddar (1947) and Pathan (1948). Launched many new talents through Prithvi Theateres, including Ramanand Sagar, Shankar-Jaikishen and Ramesh Saigal, all of whom later made key members of Raj Kapoor film units, including his sons Raj, Shammi and Shashi. While directing Paisa, he lost his voice and never regained its original sonorousness. Had to close the theatre and reduce his film work in the late 60s and 70s; acted in several Hindi and Punjabi mythologicals and credited with the revival of Punjabi film industry. Died of cancer in 1972. Akkineni Lakshmi Vara Prasada Rao (17 January 1908 – 22 June 1994), who is also referred as L.V. Prasad is an Indian film producer, actor, director and businessman and also one of the pioneer of Indian cinema. He was awarded the prestigious Dada Saheb Phalke Award for his outstanding contribution to Telugu cinema by the Governament of India in 1983.He was the first person to be awarded by the prestigious Raghupathi Venkaiah Award by the state government of Andra Pradesh in the year 1981. Laxmi Vara Prasad Rao was the second son to Akkineni Sriramulu and Basavamma in a small village, somavarapadu, in Eluru Taluk in the State of Andhra Pradesh in India. He was a very intelligent boy but never interested in studies. His attention was drawn on to the touring theatres and drama troupes. He regularly used to go to drama stages to watch them and use to do small roles in the local dramas. Later this passion itself let drove him for acting and moving image. He got married to his maternal uncle’s daughter Soundarya Manoharamma, at the age of 17th in the year 1924 in a truly cinematic style and atmosphere and they had a baby girl v.soon. By the time Prasad looking for a cinema career, his father was forced to declare insolvency due to mounting debts. This state has thrown the family into deep state of depression and humiliation. At that time Prasad thought about his acting prowess to make a career, so one day with 100 rupees he left the village without telling anyone. Prasad had thought to work at a studio called Kohinoor in Dadar where cinemas are made and artists congregate but as he neither know to spoke in Hindi or English he obtained as a cleaner in tailor’s shop, which had provided with accommodation. He realized that his dream of getting into films is not so easy to achieve. Though his ambitions are going farther every day, after somedays He somehow landed as errand boy’s job in Venus Film Company and where he met a Punjabi youth called Dharilal. In Dharilal they offered Prasad a job in a carnival to do a little bit of acting. Then he joined India pictures as an errand boy .At that place Akthar Nawaz cast him in a bit-part role in the silent film ‘Star of the East’ but this film has never released. Dharilal’s siter moti who was working in Imperial Film Company and she gave a bit role to Prasad in Ardeshir Irani’s ‘Alam Ara’ which is the first India Talkie Cinema released in 1931. Later he did other minor roles which were made by Imperial Films, where he met H.M Reddy. He gave Prasad a small role in the first Tamil talkie and next also in the 1st Telugu talkie film Baktha Prahlada. He had sent his family a telegram about his success but in return he had given very sad news of his little daughter’s death.Then after he returned to Bombay with his wife where his sons, Anand and Ramesh were born. Later Prasad got chance as an assistant director in Kamar-Al- Zaman, which is directed by Ali Shah. At this time itself his name has shortened to L.V.Prasad as it is too long to use but this film was stopped after shooting three reels. He satisfied his acting passion trough his connections with Prithviraj Kapoor by joining Prithivi Theatres. Later in 1943 he first got the opportunity as assistant director for for Gruha Pravesham but next due to some reasons he became the director of that film and he choosen also as a lead actor to that film. In the year 1946 Gruha Pravesham has released and it is one of the finest films of that times. In 1949, Prasad has introduced N.T. Rama Rao under his direction with Mana Desam Movie. Then in 1950 L.V Prasad first directed film ‘Shavukaru’ has released by Vijaya Pictures by which N.T.Rama Rao became a lead actor and Janaki is a heroine. L.V. Prasad had established Prasad Productions. At Chennai in 1956 Prasad Film Labs was established by his second son Ramesh after his return from the United States after obtaining his B.E.M.S degree. Many hits like Milan, Khilona, Sasural, and Ek Duje Ke Liye are hits of Prasad Productions. L.V. Prasad had contributed generously towards the establishment of L.V.Prasad Eye Institute in Hyderabad. In his lifetime L.V.Prasad held many posts and won many awards like Filmfare Award for Best Film – Khilona and many more other awards. Wazir Mohammed Khan singing first Indian film song, "De De Khuda Ke Naam Pe"
J. Sushila is an actress. A rare still from Ardeshir Irani's Alam Ara, the first Indian talkie (1931). Lyrics and video of songs from Movie / Album : Alam Ara (1931); Music by: Firozshah Mistry, B Irani; having ... Latest Top 10 Songs new. Week 31 (05-08-2013). 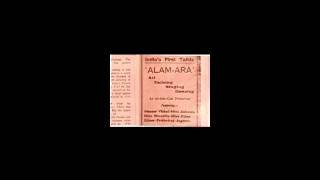 SongsPkMp3.co Alam Ara 1931 First Sound film India Offical Duration : 3 ... Duration : 14 Mins | Size : 31 MB | Speed :80 kbps | Uploader : filmimpressions. ... seen Alam Ara. Asked by naushin, 03 Sep '08 02:32 pm , 4 answers ... The song from the movie Alam AraConfused the link is not functioning in your Q... more. Check out the latest movie review, trailers, story, plot, music videos, songs, wallpapers, cast and crew details of Alam Ara hindi movie on Gomolo.com. Alam Ara debuted at the Majestic Cinema in Mumbai (then Bombay) on 14 March ... Both the movie and its music were widely successful, including the hit song. Mar 14, 2011 - Today is the 80th anniversary of Alam Ara aka The Light of the World, ... at the Majestic Cinema in Mumbai (then Bombay) on March 14, 1931. Aug 1, 2011 - Ardeshir Irani's Alam Ara was first indian movie with sound. This movie released in 1931. This film ... Song - More saiyan Ji Utrenge Paar ho. This song carries the credit of being the first song ever to be played on the Hindi film screen. The name of poet is lost in history. Eighty One years ago today, 14th March, 1931. The sounds of this song heralded the arrival of talking films on Indian screen. For about 20 years now, people have gotten used to going to theatre that does not have a stage, and has no live actors who would present a play. Rather, in a hall without any lights, a big size picture is projected on a white screen. Twenty five, thirty years ago, when the white men with projecting machines brought moving pictures to India, it was a thing of wonder. How can a picture move? How can a moving picture tell a story? Why are they creating a theatre without live artists? A wonder of technology had forever changed the culture and the meaning of entertainment. But then, there was news about moving pictures that could also talk. But wait, there was already music in the pictures, played by live artists sitting in front of the stage. And some pictures even had sounds of gunshot, or galloping horses. What do they mean that these pictures will have sound? Why would anyone want to go and see such a picture? Why, one would rather go to the theatre and see a play, and hear the voices of live actors? Well, these technical people are crazy. Talking pictures? Bah, just a passing fancy. They will not last. People with such observations were many. For them, the silent picture medium was complete in itself, with no room for improvement. A second revolution came, with the talking pictures, and the concept of entertainment changed once again, and forever. The storytelling became emphatic, as now there were words accompanying the expressions and gestures. And the medium became more complete with the aural senses gaining the same ground and the visual and the emotional dimensions. But an event of much greater, much more profound significance happened this day, eighty one years ago. That fateful day is also the birth of what we now refer to as the Hindi film song. Arguably, the music and the song transformed this medium, much more drastically than simply the ability to talk. Today, is the 81st birthday of the music in films. Today is the celebration of that which moves the hearts of millions of music lovers. Today is the celebration that is the soul and spirit of this blog. Today is a day to stand up and salute the beginning of this wonderful art form. The complete storyline of this film is available online on some websites. And for the friends who subscribe to the ‘Listener’s Bulletin’ (published by Harmandir Singh ji ‘Hamraaz’), the complete story is published in the issue no. 47. The name ‘Alam Ara’ variously means the ‘Light of the World’, ‘Jewel of the World’, ‘Adornment of the World’, ‘Honor of the World’. It is a tale of two young hearts in love, and it exemplifies the power of faith. The love is between a royal prince, Qamar, and a gypsy girl, Alam Ara. The setting is a royal palace, and the film starts with a rivalry between the two queens of the emperor. This rivalry is the precursor to the events in the film. As a result, the child Alam Ara, daughter of Adil, the commander of royal forces, is destined to be brought up in a gypsy camp, by Rustam. The story tells of the trials and tribulations of faith faced by Alam Ara, and how she is triumphant because of her belief in God. This song carries the credit of being the first song ever to be played on the Hindi film screen. The name of poet is lost in history. The music is composed by Pherozeshah M Mistry. The singing voice is that of Wazir Mohammed Khan, who plays a fakir and a beggar. And he is singing this song, as he begs for alms in the street. And of course, the song is performed by Wazir Mohammed Khan himself on screen. Wazir Mohammed Khan, born in 1902, was all of 29 years old when this song was recorded live in 1931. Wearing a very white fake beard, he played the role of an elderly mendicant, who begs in the streets. The song that is featured in this clip is not the song from the original film. So far as the information is available to date, there are no prints available of this film. In 2003, a disastrous fire in the National Film Archives in Pune resulted in the last known print of this film being destroyed (along with many other rare films). The practice of releasing films songs on records did not come up till 1933-34. And hence no songs of this film are available as records. This film was remade twice. Once in 1956 and the second time in 1973. The 1956 version was produced and directed by Nanubhai Vakil, under the banner of Desai Films, Bombay. The music is by AR Qureshi, and the lyrics are by Shewan Rizvi. The star cast includes Chitra, Daljit, Maruti, Niranjan Sharma, Hira Sawant, Meenu Mumtaz, Jeevankala, Rajan Haksar, Sadiq, amongst others. After a gap of 25 years, Wazir Mohammed Khan reprised his role as a fakir in this film. The 1973 version is produced by Mafatlal Shah and is directed by Nanubhai Vakil, under the banner of Jaishree Films, Bombay. The music is by Iqbal Qureshi and the lyrics are by Kaifi Azmi and Hasrat Jaipuri. The star cast includes Nazima, Ajit Sachdev, P Jairaj, Mohan Choti, Uma Dutt, Rajnibala, Mohan Sherry, Munshi Munakka, Bhushan Tewari, etc. And yet once again, Wazir Mohammed Khan, now 71 years old, played the same role of the fakir in this third incarnation of this costume drama. This song does not appear in the list of songs of the two later versions of the film in 1956 and 1973. But in fact, Wazir Mohammed Khan has rendered this song in both the 1956 and the 1973 films. The rendering is live, in his own voice, and to the same tune that is the original melody created by Pherozeshah M Mistry. This particular clip is from the 1973 version of Alam Ara. In this film, this song is rendered twice in quick succession. It is the holy month of Ramzaan, and the faithful are observing the traditional fast from sunrise to sunset. Alam Ara (played by Nazima) is a steadfast believer in the beneficence of God, and is observing the Rozaa. Uma Dutt plays the role of her foster parent and guardian, having found her as a small child abandoned in the forest. (NOTE: the story line of this versions varies somewhat in detail from the original version of 1931.) After the sunset, when it is time for ‘iftaar’, the traditional breaking of the fast, and Nazima is settling down to her meal, Wazir Mohammed Khan, playing the role of fakir, appears on the scene, and begs for ‘iftaari’, the traditional meal after sunset on the day of fasting. Nazima is moved by his request. She offers him everything from her plate, and herself makes do with a pinch of salt and a glass of water. The second day, the same scenario is repeated. Nazima is settling down for her ‘iftaari’ meal, when the fakir appears once again, and sings the same song, begging for the sunset meal. And once again, Nazima offers him everything from her plate. The fakir blesses her and goes away. After he leaves, and Alam Ara prays, her plate is suddenly full with choicest fruits and sweets, by the grace of Allaah. The third person visible in this clip is Uma Dutt. Even though this song is not the true original song, yet this song still carries a historic significance. The lyrics, and the tune and the singing voice are original. Only that it has been re-sung after a gap of 42 years. (NOTE: this is the complete song, as per the original booklet of the 1931 version of the film). India's first talkie film was released at Bombay's Majestic cinema hall. It had seven songs and was 10,500 ft. long and ran for seven weeks. It was a costume drama and romantic film. A period fantasy that told of the ageing king of Kamarpur, and his two rival queens, Navbahar and Dilbahar, and their rivalry when a fakir predicts that Navbahar will bear the king's heir. Dilbahar unsuccessfully tries to seduce the army chief Adil (Vithal) and vengefully destroys his family, leaving his daughter Alam Ara (Zubaida) to be raised by nomads. Eventually, Alam Ara's nomad friends invade the palace, expose Dilbahar's schemes, release Adil from the dungeon and she marries the prince of the realm. March 14, 1931 was a historic day for Indian cinema. Ardeshir Irani of Imperial Movietone released Alam Ara, the first full-length Indian talkie film at the Majestic cinema in Bombay. This film very effectively broke the golden silent era and laid a milestone that marked the steeping into the new talkie era as well as rang the death knell to silent films. However, it was the Warner Bros who had only a few years earlier launched the sound era with Don Juan (1926) starring Mary Astor with synchronised musical score and sound effects and followed by Jazz Singer. But it was Lights of New York (1928) that was the first talkies film followed closely by Hitchcock’s Blackmail (Britain) and Rene Clair’s Sous Les Toits Paris (France). Meanwhile, India’s first synchronised film Melody of Love was by Madan Theatres in 1929. Written by Joseph David, a playwright from the Parsi Imperial Theatrical company, the play Alam Ara had already proved to be a popular success. The story is about the king of Kumarapur’s two queens, both of whom are childless. A fakir’s prediction that the good queen Navbahar will bear a son comes true, eliciting the intense jealousy of the wicked queen Dilbahar. Dilbahar fancies Adil, chief of the army but the latter spurns hers. In retaliation she has him imprisoned. Adil’s wife dies giving birth to Alam Ara (Zubeida) who grows up in a gypsy camp. One night she goes tot he palace in search of her father, when a charm aroud her neck reveals her true identity. There she meets the young prince (Vithal) and they fall in love. In the end, Adil is released, Dilbahar punished and the lovers married. Inspired by Universal’s Showboat, Ardeshir Irani went about to produce Alam Ara. The film took months to make following the hazardous recording conditions, the distressing laboratory processing methods of that time and the secrecy surrounding the project. Says Irani , "There were no sound-proof stages , we preferred to to shoot indoors and at night. Since our studio is located near a railway track most of our shooting was done between the hours that the trains ceased operation. We worked with a single system Tamar recording equipment. There were also no booms. Microphones had to be hidden in incredible places to keep out of camera range." Irani and his assistant Rustom Bharucha picked up the rudiments of recording from Wilford Deming, an American engineer, who had come to India to assemble the equipment for them. Deming, the methods of film production had come as quite a shock. "Film was successfully exposed in light that would result in blank film at home, stages consisted of flimsy uprights supporting a glas or cloth roof or covering. The French DeBrie camera, with a few Bell & Howell and German makes, completed the list of photographic equipment." As a film, Alam Ara had few technical and artistic qualities but it was pioneering effort. In a letter to the Times of India (March 23, 1931), a viewer who signed as Filmster wrote about the quality of sound, "Principal interest naturally attaches to the voice production and synchronisation. The latter is syllable perfect; the former is somewhat patchy, due to inexperience of the players in facing the microphone and a consequent tendency to talk too loudly." Alam Ara's rather predicatable story line managed to string together the numerous song and dance numbers. And much to the filmmaker's surprise, the Majestic cinema in Bombay where the film was released was mopbbed by surging crowds. Recalls Irani's partner Abdulally Esoofally in the Indian Talkie Silver Jubilee Souvenir, " In those days, the queue system was not known to filmgoers and the booking office was literally stormed by jostling, riotous mobs, hankering to secure somehow, anyhow a ticket to see a talking picture in the language they understood. All traffic was jammed and police aid had to be sought to control the crowds. For weeks together tickets were sold out and blackmarket vendors had a field day." Meanwhile, the success of Alam Ara led to a rush of other films into production. Producers enticed actors from the stage as voice was the chief criterion and not all actors of the silent era could adapt to sound. Three weeks after Alam Ara, Madan Theatres' released Jamai Sashti (Bengali), followed by Alam Ara; Shirin Farhad (Urdu) which was a spectacular success, featured the most popular singing pair, Jahan Ara Kajjan and Master Nissar, was recorded on RCA photophone sound system and contained three times as many songs as Alam Ara; Kalidas (Tamil, 1931), Bhakta Prahlad (Telugu, 1931), Ayodhyecha Raja (Marathi, 1932), Narasimha Mehta (Gujarati, 1932), Dhruva Kumar (Kannada, 1934). However, the arrival of sound in spite of being welcome in several quarters had serious implications for the whole industry and its appendages. The talkies era silenced a whole generation of artists, film-makers and technicians. Many studios unable to switch over to sound closed down; Anglo-Indians who did not speak fluent Hindi or Urdu were the worst hit. Those who could not sing were also hit as there was no playback and direct recording meant artistes had to sing their own songs. In Cinema Vision, Ram Mohan quotes veteran film technician Krishna Gopal, "Problems? Of course we had problems--thousands of them--no one knew how to handle the sound equipment. We did not know how to deal with echoes inside the studios. The cameras had no blimps ad their noise drowned out the dialogues. We tried all we could to muffle the camera noise. We wrapped the camera in blankets, put insulating shields around it. Nothing seemed to work. We couldn't hear a word the actors spoke inside the studio." When the shoot was moved outdoors, the quality of sound improved "but one cannot shoot an entire film outdoors. Even in a historical, the characters have to go home sometimes." Long takes from a single point became a necessity because of the many unsolved problems of combining photography with sound. Actors had to huddle around a hidden, low-fidelity microphone, often resulting in self-conscious performances. Picturisation of songs too were done in a single shot. Trial and error resulted in mush wastage of raw stock and many films had to be abandoned. However, there was the other side to it too. The box-office returns were so fabulous that they came to be known as mortgage-lifters, enabling those cinema houses that had shut down during the Depression to reopen. Also, it gave a temporary respite from pressing foreign competition. Foreign films now suffered a reversal . English dialogue limited the audience to European and a small number of English-speaking Indians. * Whenever, they (the Talkie people) camped, they were given a princely ovation and a hero's send-off. The Railways gave them travel concessions; the guard at Trichy junction delayed a train by four minutes for the latecomers; a theatre propreitor in Salem slept by the loudspeaker on the stage to guard it during their stay there; every coffeehouse they visited in Tumkur district town in Mysore refused payment for food and drink; in Burhampur the cinema propreitor took the party around the vegetable market, where the best of vegetables were presented to them. * Although Mehboob was scheduled to play the lead in Alam Ara, Master Vithal; from Sharda Studios got the part. When Sharda sued Vithal for breach of contract, he was defended by M A Jinnah. 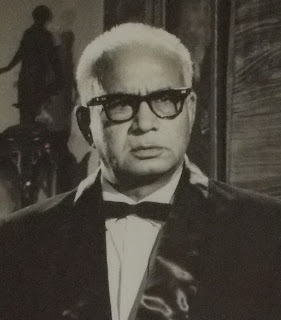 Ardeshir Irani, who Fatma worked with as an actor, incidentally is the father of Indian talkie films, having made both “Alam Ara” (in Hindi) and “Kalidas” (in Tamil, with songs in Telugu). Fatma Begum, India’s first woman film director. Clearly different people, don’t you think? It is interesting (and worrisome) to note that the internet doesn’t have a single undisputed image of the first woman director in one of the world’s largest film industries. On days like these, we at TCRC find renewed vigour in our attempt to archive cinema-related artifacts. Have you found other such examples with respect to information about the early days of cinema? Do share them with us by writing to tcrc.india[at]gmail[dot]com.